This week’s theme includes kitchen products, bathroom and personal grooming items, and baby/toddler toys and health and safety products. We also saw some foods advertised for the upcoming “Big Game” for all the football fans. 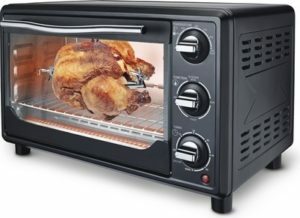 Ambiano Convection Countertop Oven, $36.99. A fan circulates heated air to cook foods evenly. This includes rotisserie accessories. Crofton Chef’s Collection 12″ Hard Anodized Fry Pan or Round Grill Pan, $19.99 each. These feature hard anodized aluminum for durability. Crofton Chef’s Collection Hard Anodized 4.5-Quart Dutch Oven, $24.99. Crofton Chef’s Collection Acacia Chopping Block, $14.99. Choose a Natural or Checkered design. Ambiano Food Dehydrator, $24.99. Dries fruits, vegetables, meats, herbs, and more. Recipe book included. Crofton Adjustable Mandoline Slicer, $8.99. Huntington Home Signature Bath Towel or Hand Towel and Washcloth Set, $4.99. Available in Taupe or Gray. Huntington Home Signature 20″ x 34″ Memory Foam Bath Mat, $9.99. Choose plush with ribbed edge or luxury shag option. Assorted colors. Read our review of Aldi’s Memory Foam bath mat from several years ago at this link. Easy Home 2-in-1 Showerhead Kit, $29.99. Includes 5-function handheld, full-spray showerhead. Easy Home Pebble Bath Mat, $3.99. Visage Professional Hair Dryer, $19.99. Three heat settings and two speeds. Ionic function leaves hair smooth and shiny. Visage 3-in-1 Trimmer, $6.99. Read our review of Aldi’s trimmer from two years ago at this link. Dentiguard Rechargeable Sonic Toothbrush, $19.99. Features four sonic modes: standard, sensitive, whitening and deep clean. Includes a two-minute smart timer. Read our review of Aldi’s rechargeable sonic toothbrush at this link. Dentiguard Ultra Whitening Strips, $12.99. Claims to remove years of tough stains with a ten-day dental whitening system. Easy Home Decorative Waste Bin or Toilet Brush, $9.99 each. Decorative Waste Bin is hands free and foot operated. Decorative Toilet Brush features tip-resistant weighted base. Little Journey Children’s Potty Chair, Potty Seat, or Double Step Stool, $6.99. Welby Ear/Forehead or Non-Contact Thermometer, $14.99 each. Welby Waterless Vapor Wall Plug and Nightlight or Refills, $4.99. Safe for use with babies over 10 lbs. Little Journey 2-Pack Sippy Cups, $3.99. Assorted varieties available. Dreambaby 3-in-1 Play Yard, $59.99. Features 10 sq. ft. of play space with durable steel construction. Little Journey Alphabet or 17″ Shapes Foam Mat, $12.99. Little Journey Hot/Cold Buddies or Wraps, $9.99. Fisher-Price Musical Elephant, Plush Hippo or Tummy Wedge, $14.99. Choose from Music and Lights Elephant, Tummy Time Wedge, or Projection Hippo. Little Journey Storage Caddy, $4.99. Great for holding diaper essentials or toys and art supplies. Little Journey 2-Piece Plush Baby Blanket and Cuddle Buddy, $9.99. Assorted varieties available. Kirkwood Buffalo Style Zings, $5.49 for 25.5 oz. Sold frozen. Kirkwood Oven-Roasted Chicken Wings, $5.49 for 16 oz. Sold frozen. Mama Cozzi’s Dip-N-Strips Pizza, $4.99 for 33.5–34.5 oz. Choose pepperoni or four-cheese. Read our review at this link. Mama Cozzi’s Meat Lover’s Pizza, $4.29 for 30.75 oz. Mama Cozzi’s Toasted Ravioli, $2.99 for 16 oz. Choose beef or cheese. Read our review here. Appetitos Appetizer Bites, $3.59 for 10.6 oz. Sold frozen. Choose chorizo or BBQ chicken. Fresh Boneless Lamb Loin Roast, $7.99 per lb. Ambiano, Appetitos, Crofton, Dentiguard, Dreambaby, Easy Home, Fisher-Price, Huntington Home, Kirkwood, Little Journey, Mama Cozzi's, Visage, Welby. Bookmark.